This Thursday is devoted to vampires--the vampires and their mates in Elizabeth Marx's paranormal series. We are today's stop on the Red Veil Series Blog Tour hosted by Full Moon Bites Blog Tours. As many of our readers know, I love vampires. In film, in graphic novels, manga, anime, and especially in books. I'm always looking for new and unique tales about these fanged immortals so imagine my happiness at discovering a new author of a series which has become my favorite of 2013--Elizabeth Marx's Red Veil series. "When all hope is lost, one vampire will fight unto death for his forbidden love." That line captures the true feel of the prequel story, Descent of Blood. What can I say about about Severian Pearce, Vampire Prince and all around great guy? The way he commands a scene, a quiet yet threatening presence, made him an instant favorite. I haven't been this excited about vampires since reading and adoring the Vampire Empire series by Clay and Susan Griffith. What I thoroughly enjoyed about Descent of Blood was, well, everything! From the opening chapter, I couldn't move my eyes off the page. First meeting Meridian as she hides herself from becoming a victim of a murderous spree taking those she cares for at her home to Severian's walk through the same castle viewing the carnage. When they meet I realized I was already taken by this story. Things only got better from there. I need to say how impressed I am with author Elizabeth Marx. This is self-publishing at its best. Yes, there were typos (and I find them in a lot of books, no matter the publisher), but the heart of this story, the characters, dialogue, descriptions, plot, and pace of Descent of Blood exemplify just how well-written this work is. It is entertaining and made me an instant fan. Marx has successfully blended the 'feel' of historical with the hint of a blooming romance along with the threat of blood drinking creatures. There are Nosferatus--the 'true' vampires who pass on their infection--to the "Houses" of the vampires (classification system) to war hounds and more. The attention to detail was apparent. My favorite characters were Severain, Meridian and Philabe. The idea of a "red veil" linking an immortal to his true love fascinated me. The politics of war and deceit of 1464 in Scotland was well conveyed and came to life in my mind. What I truly loved was the chemistry between Severain and Meridian. What a couple! Both strong minded and smart, he has to deal with her stubborn ways and she has to have patience with his 'old' ways of thinking and treating women. This theme was quite apparent in Ascent of Blood, the next book in the Red Veil series which tells the story of their son, Sebastian Pearce, and his pursuit of the American woman, Dr. Everleigh Marbut. This time history jumps ahead six hundred years to Wales as he is alerted to a woman searching for knowledge of a certain book. I wasn't immediately taken with Sebastian as I was with Severain. He was brooding and moody, and over time I came around to liking him as I understood him. Everleigh was a great character--feisty, intelligent, and quick with the snark. She made me laugh with her retorts. Again, the author created quite a story. Sebastian is aware of the Red Veil with the outspoken American, but she has her own baggage. She is human, a breeder, and his true mate, and she is already pregnant. Hmm... This revelation may be surprising and the way the author expounds upon this conflict only made me more of a fan. 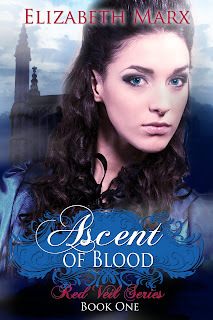 A new set of characters to like from Gillian to Cain, Ascent of Blood told an involving and engaging story. I loved both stories in this series and hungrily await the next novel by Elizabeth Marx. Vampire fans and paranormal junkies should have this series on their reading radar. A solid 5 for both. Love this series! I like them both but I am curious as to what the leading men look like. Perhaps we'll be privy to one on the next cover? I received a promotional copy of both books in exchange for my honest review. 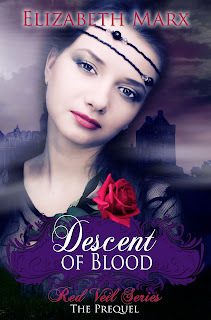 Thanks so much for reading and reviewing DESCENT OF BLOOD & ASCENT OF BLOOD. I'm so thrilled you liked them. 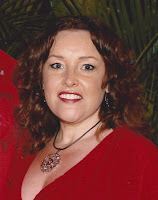 Stop by my author page where I've posted a picture of Cain along with a link to your review.